Couch forts, skipping rocks, snowball fights, rolling down hills and catching fireflies. < <— Can you spot what’s missing from this list? Yep, cookie dough! I’ve been reading (and loving) this book on the seven essential life skills kids need lately, but in addition to skills there are experiences I want my littles to carry with them always. Although sweets are an occasional treat in my house, you can bet that the memory of eating cookie dough is one of them! 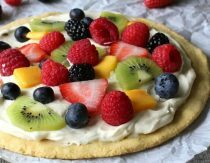 Unfortunately, if you’ve ever made paleo versions of old favorites – this pizza for example – you know that while the finished recipe can be every bit as satisfying as the original, the mid-process recipe can be very, uh, different. For example, unlike traditional dough, my cauliflower crust is spreadable before it’s baked into crusty goodness. Although we love our favorite chocolate chip cookie recipe, it doesn’t quite have the texture and flavor I loved as a child. 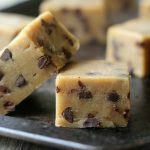 For this cookie dough fudge, I adapted the base from my ice cream sandwiches to be softer and more chewy, while still retaining the browned butter flavor that makes the recipe. Even my cookie dough hating alien husband loved them, which is saying something. I hope they’re a hit at your house, too! Cut butter into four equal chunks and place in a light colored, shallow pan. Heat pan over medium high heat and stir butter until it is light brown and smells a little like hazelnuts. 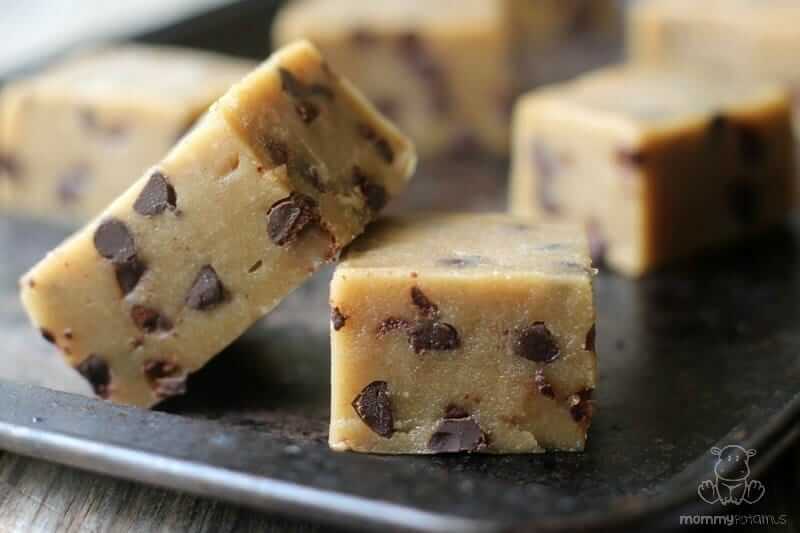 It's important to watch it closely or it will burn, but browning the butter is what makes this cookie dough fudge so delicious. See this tutorial if you're not quite sure what to look for. Allow butter to cool before moving on to the next step or your chocolate chips may melt a little. You can put it in the fridge if you're in a hurry. Add almond flour, cashew butter, maple syrup, vanilla, browned butter and sea salt to a food processor and mix thoroughly. If you don't have a food processor, add all dry ingredients to a bowl and mix, then add wet ingredient and mix again. I prefer the food processor because the dough is a little more smooth. Stir in the chocolate chips by hand. This step takes a little elbow grease. Press dough into a bread pan lined with parchment paper and freeze for at least 5 hours. Cut into chunks before serving. Is this safe to eat raw, the flour isn’t cooked? 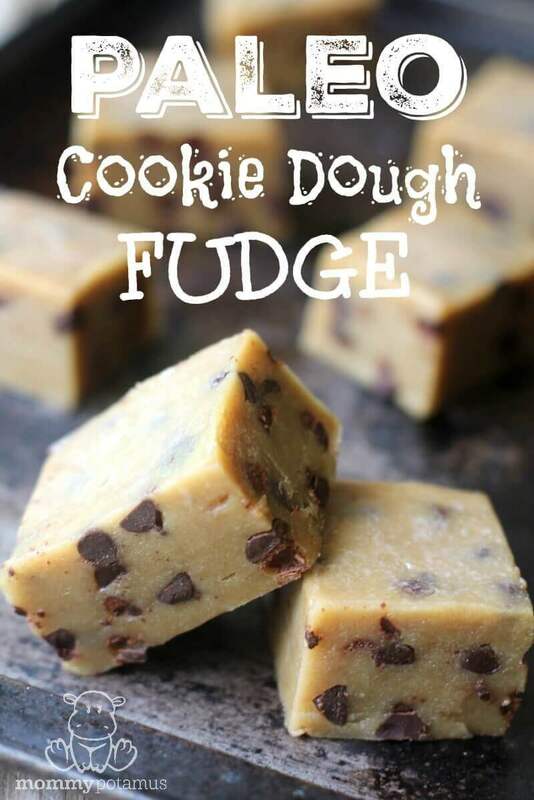 Thank you for posting the cookie dough fudge. Its not full of unhealthy Ingredients so I can have it.thanks again Dienna. Oh yum!!! I’m very tempted to get the ingredients to make this! Can we chat about nut butters? How do you feel about eating butters that are not made from crispy nuts…ok once in a while? I miss nut butters, but I don’t have the equipment to make my own, and no one seems to sell a soaked nut variety. Wilderness Family Naturals sells soaked nut butters. This looks delicious! Do you think clarified butter would work in this recipe? It will work from a functional standpoint, but the flavor will be different and you wouldn’t want to do the browning step. It’s the proteins in milk that can be browned in order to add the caramel/toffee flavor, so clarified butter would be missing that part of the flavor. So good to know! Thank you for the recipe and help! These look delicious! Idk who would be more excited about these, my daughter, husband or myself. haha! Cant wait to make these! Do you think if I added nuts or dried fruit with the chocolate chips they would fall apart or they fall apart? Thanks! This looks great! I don’t see the link to the “see this tutorial” for browning the butter. I’ve never browned butter but my friends does with her rice and it tastes excellent. Thanks so much for sharing! Thanks for letting me know about that. Just updated the post! We have nut allergies. 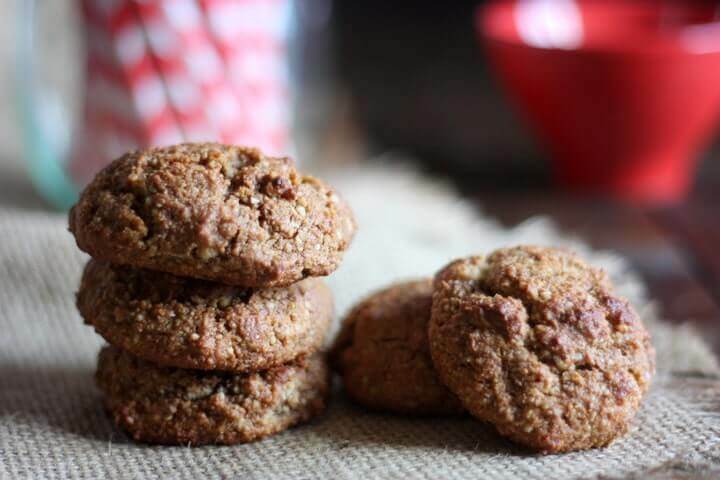 Have you ever tried making this recipe with Bob’s Red Mill GF flour and Sunflower seed butter instead? I haven’t, sorry! If I had to guess I’d say it would do better with finely ground sunflower seeds and sunflower seed butter rather than Bob’s Red Mill. I’m wondering the same thing! I’m tempted to try some palm shortening to see how it comes out. I just can’t decide! Do you know if I could make my own cashew butter just by soaking them and then blending them in a Vitamix? Or is there more to it? I am also interested in a nut butter alternative. My son is severely allergic to cashews. Would almond butter work? Thanks for the yummy recipe! Wow! This is so good and incredibly easy to mix up. Oh my, he does! I texted my sister “Mommypotamus for the win” about this recipe. I tried making the Cookie Dough Fudge but mine didn’t turn out. It was very dry from the coconut flour. Do you have a video? Yours looks so smooth and amazing. I definitely want to try again. Hi Leslie, did you perhaps misread almond flour as coconut flour while you were mixing things up? Coconut flour would definitely be too dry, but almond flour will work beautifully. This sounds awesome! I do something kind of similar but without any flour. I mix equal amounts of coconut oil, cashew butter and unsweetened dried coconut then stir in either mini choc chips or raw cacao nibs (depending on how virtuous I am feeling) Once it’s combined I store in the fridge. So easy, no sugar, and actually a pretty decent snack. Sometimes I spread it on apple slices. If it sits out it gets kind of runny, but then you can dip the apples. Hi! How many servings does this make? I’m just realizing my comment is a year late… So I don’t expect a response ? So I made this tonight and the exact same thing happened! I’m wondering if that’s also what I did wrong- mix it too long- or could something else have caused this to happen? Pretty sure I have the right amounts of everything. I tend to get a little generous with my Kerrygold but I don’t think I was THAT generous! I have a layer of liquid fat on top of the dough. I love fat. Nothing against it but I’m not sure how this will turn out? It’s in the freezer and it’s been there for a couple hours and there’s definitely still some liquid on top? Thankfully it still smells incredible! It sounds like it was overmixed or the kitchen was too warm. I once tried to make whipped cream in a hot kitchen and accidentally churned butter instead because the milkfat separated from the whey. Something similar can happen with almond flour and fat – it basically can become almond butter. 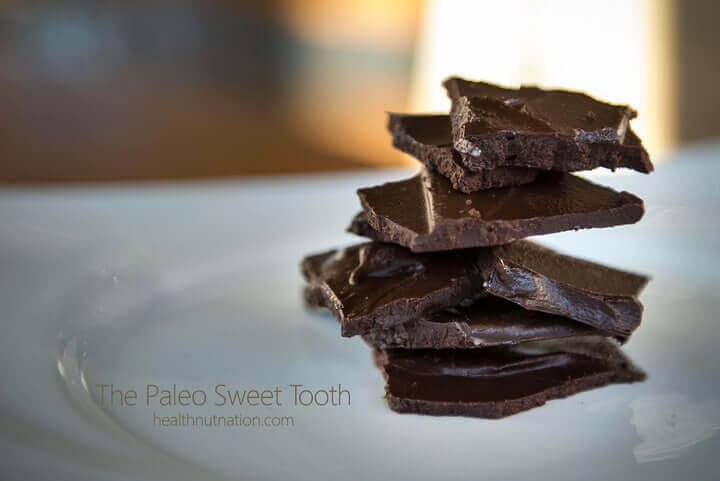 I absolutely love the ingredients in this recipe… unfortunately I can have maple syrup or honey or sugar… do you have any suggestions for substituting stevia for sweetener? I realise that’s a lot of liquid to talk out so would you have a suggestion for substituting? Made it – yummy!! Used goat butter to the same delicious effect! Could you please let us know how to store these? Fridge or freezer? I sent a piece into school with each of my sons today. So hoping they don’t melt into a mess. Love your work! Thank you!!! Some people use ground sunflower seeds. 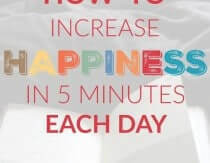 I haven’t tried it but it may work. But what could we use instead of butter? I’ve never made fudge before until now. My son requested cookie dough fudge so I thought I’d try this. It was very easy to make and tastes just like cookie dough! I can only dabble in these a little because I’m doing Keto. Everything in this recipe is Keto-friendly except the choc chips (no biggie to find a replacement Keto choc chip) and the maple syrup. What could I use to replace that?